Cypriot Foreign Minister Ioannis Kasoulides asked on Wednesday (10 February) whether the fight against Islamic State (or Daesh, as it is called in Arabic) was a priority for Turkey. Speaking at a conference organised by the European Policy Centre (EPC), Kasoulides spoke of “certain question marks around Turkey”. “It’s up to Turkey to decide what its relations will be vis-à-vis the countries in the region. What are Turkey’s relations with Israel, with Egypt?”, Kasoulides asked, referring to the worsening relations between Ankara and Tel Aviv, as well as with Cairo. Kasoulides said that Turkey’s top priority was the PKK, the Kurdish rebel organisation which, between 1984 to 2013, fought an armed struggle for Kurdish self-determination, and a security zone inside Syria, which the he said was intended to occupy an area inhabited by Kurds. The second Turkish priority is the fight against the Assad regime in Syria, the Cypriot minister said, adding “and I don’t know whether the third, or forth, or fifth priority is the fight against Daesh”. Kasoulides also pointed out “how porous the Turkish border is”, both as an entry point for foreign fighters coming from other countries, including Europe, and also for them entering Syria. In contrast, Kasoulides highlighted the role of Cyprus in combating international terrorism, the issue being at the centre of the EU summit tomorrow (12 February). Kasoulides drew attention to the situation of Lebanon, a country which, he stated, had assumed a huge burden over the Syria crisis. The minister noted that Cyprus provided assistance to Lebanon and called on the international community to support this country in effectively coping with the threat of terrorism spreading there as well. 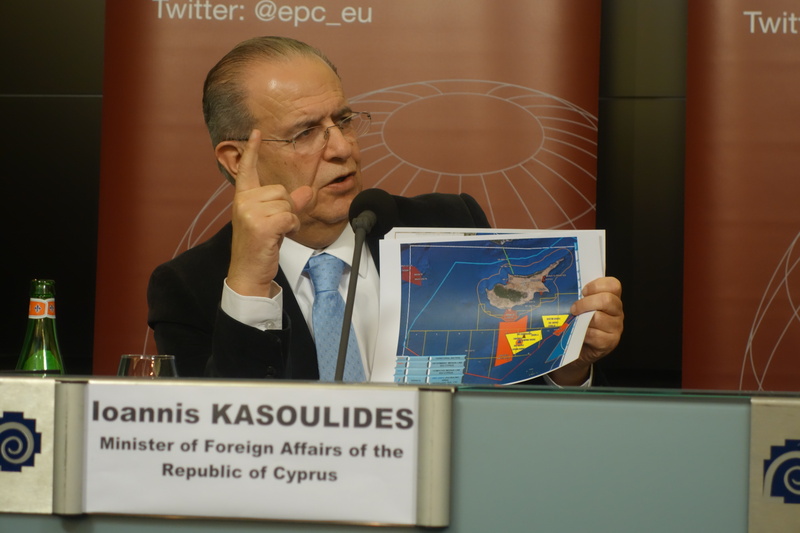 “There is a legitimate fear that if terrorists advance to the shores of the Mediterranean, this would create an immediate threat for the security of Cyprus,” Kasoulides said. In his analysis, ISIS was created by the Syrian civil war, the international community having “largely miscalculated the Syrian crisis”. The minister said that his country’s view on resolving the Syrian conflict was to create an Iraq-type solution, through the formation of a unity government composed mainly by the Ba’ath Party and the Assad regime, without Assad on the one hand, and elements of the moderate opposition, specifically moderate Sunnis, Alawites, Christians and Kurds on the other. “It should be remembered that the role of Russia and Iran are crucial in any such solution”, Kasoulides said. The minister also said that regarding Turkish-Cyprus relations, Turkey had decided for the first time to use force, sending naval vessels specialising in seismic exploration, into Cyprus’ Exclusive Economic Zone, without permission. Kasoulides added that President Nicos Anastasiades had decided that this gunboat diplomacy is not compatible with holding reunification talks. Answering a question, Kasoulides expressed his doubt that Turkey “could make it” to become member of the EU.